Visitors to this year’s Raymond Stampede got to learn more about the fascinating history of the event with the installation of the latest Alberta Historical Resources Foundation heritage marker. The marker details the history of the event – the first of its kind held in Alberta – dating back to 1902, when prominent rancher Raymond Knight decided to organize a skills competition for local cowboys and ranch hands. The success of the Raymond Stampede inspired the organization of similar events across Alberta, with a growing range of events and prizes that attracted more and more competitors. Held in dozens of communities across the province each year, rodeos have long been significant cultural events in Alberta that strongly reflect its great agricultural heritage. 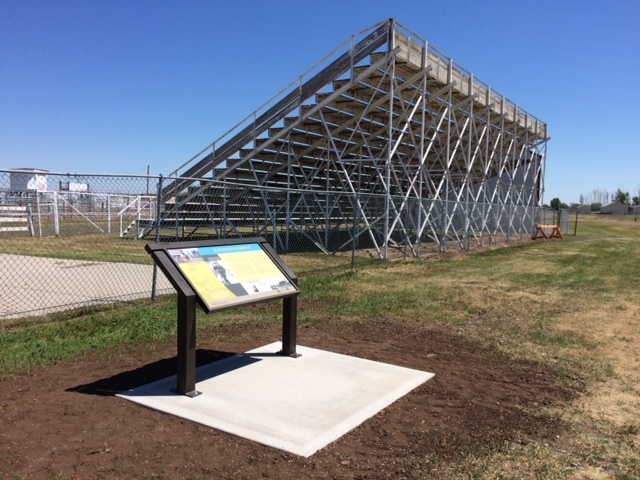 Raymond Stampede’s new heritage marker. The marker was installed on June 25, 2015 at the site of the Stampede in Raymond Knight Memorial Park. The Town of Raymond applied for the development of the heritage marker through the Alberta Heritage Markers Program. The program was established in 1955 to promote greater awareness of the historic people, places, events, and themes that have defined the character of our province. 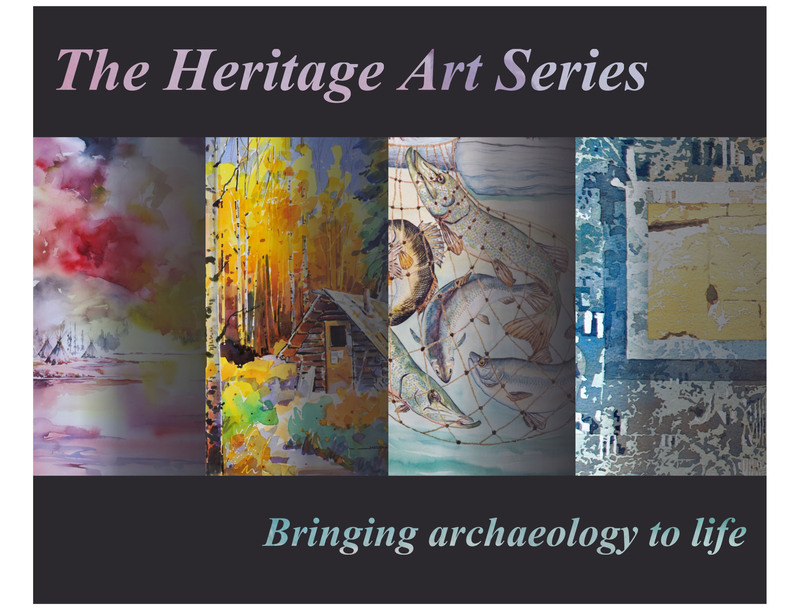 The program brings Alberta’s dynamic history alive through heritage markers placed at roadside pullouts, within parks, and in other community locales. 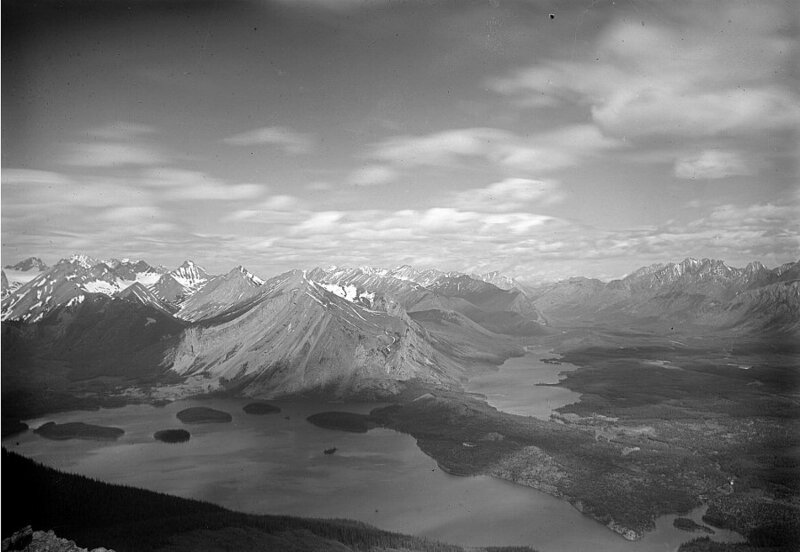 In 1917, surveyor and mountaineer Arthur O. Wheeler of the Interprovincial Boundary Survey wrote that “in a valley surrounded by towering peaks, lies Upper Kananaskis Lake, a large sheet of deep-blue water of irregular shape, dotted with heavily-timbered islands.” The lake, as described by Wheeler, no longer exists, its shape has changed and its islands are mostly gone. Upper Kananaskis Lake, 1914, showing the islands (LtoR) Cressy, Pegasus, Hawke, Hogue, Schooner and Aboukir. To compare this photograph alongside a 2007 photograph, go to http://explore.mountainlegacy.ca/historic_captures/1880/comparisons. Mountain Legacy Project, WHE14-6. The Mountain Legacy Project is based at the School of Environmental Studies, University of Victoria, Victoria, BC. For more information, go to mountainlegacy.ca, or email mntnlgcy@uvic.ca. An important mandate of the Archaeological Survey section of the Historic Resources Management Branch is to undertake extra-regulatory public outreach projects and research initiatives. The staff at the Survey have been busy this last year pursuing this goal. Some of the projects and activities that have taken place, or are underway now, are highlighted below. 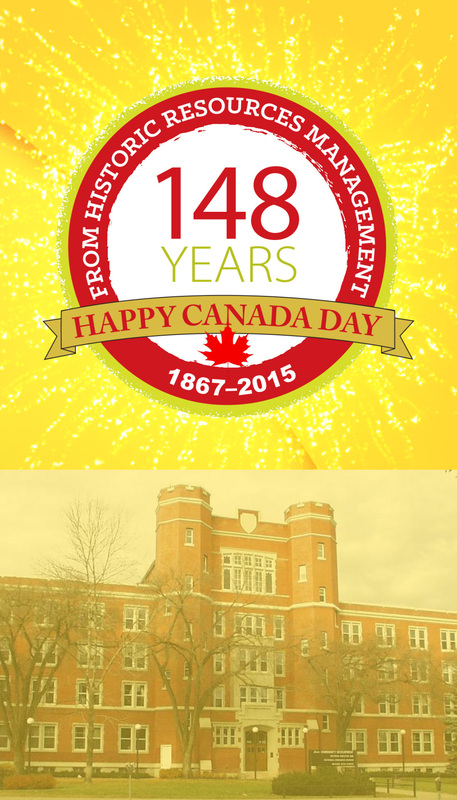 Happy Canada Day from the staff of Alberta Culture and Tourism’s Historic Resources Management Branch!